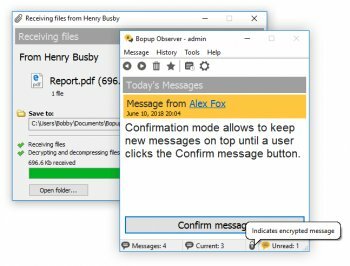 Offers secure one-way instant messenger designed to receive messages and documents over LAN, enterprise-size networks and Internet. This clear, easy to use and light-weight client is a quick and efficient solution for alerting and urgent messaging purposes. The messenger is based on a fully managed client/server platform which provides a full IM and file transfer logging, user grouping, offline and scheduled messaging. Bopup Observer fully supports Terminal Server/Citrix environment. Several authentication modes are supported: Simple, Windows Authentication or private login ID and password pair.